dynamic c# | Thinking code out loud..
Usually while building high availability Web API’s, where you know that typically your business objects are quite complex with a lot of properties returned as a part of the object, to the client, one would ideally like to give the client the ability to be able to request a specific number of fields. I am going to try to address this functionality and these points through an example and for the sake of brevity my objects will be a lot simpler to demonstrate the use case in question. And you have a REST endpoint that implements [HTTPGET] and returns a list of trips. Now the user might only be interested in getting the Name and a list of Stops within a trip for all the trips that are returned. So we need to tell the API the fields that the user wants to request. Below is one way that this scenario can be addressed. And that’s all. You can of course build on this approach and add support for multiple nested navigation fields support. Happy coding! Dynamics is a very strong yet quite under utilised feature of C# which came with C# version 4.0. The primary premise for its usage is that the “object type or data structure is not known at compile time”. In these cases the using the dynamic keyword basically tells the C# compiler to defer it evaluating the object type/ data structure to run time instead of compile time. This functionality or capability comes from another language runtime that sits on top of the CLR (Common Language Runtime) called the DLR (Dynamic Language Runtime). Now ofcourse, you would have to have Excel installed on the system where the code would run, but we will eliminate the need to reference the COM interop assemblies to our project. 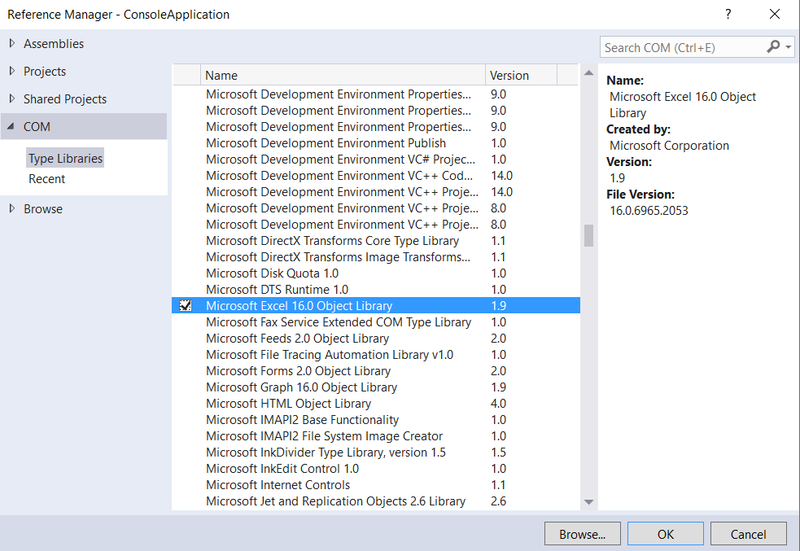 Also with use of dynamics one would need to have knowledge of the library since we do not get any intellisense support in Visual Studio once an object is declared as dynamic. This is solely because of the fact that the compiler does not know the type of the object until its evaluated at run time. So you would only see the base object methods on the intellisense. My intent here is not to create a fully featured application, rather to just show the use case of how we can use dynamics to interact with COM Interop assemblies without actually having to reference them in our projects. I am going to create a simple Console application that will launch an Excel, open a worksheet and add some information to the rows and columns. The sample code for the simple application is available on github. I am going to create a simple Person class, the data for which we will add to Excel. We get the type of the Excel application using the Type.GetTypeFromProgID into a dynamic variable. Now we can program assuming that at Runtime the variable excelType will be evaluated to Excel.Application. As long as that happens during the run time our program will run just fine. However, its noteworthy that in case the type doesn’t evaluate to Excel.Application at runtime a RunTimeBinderException will be thrown when we try to access any properties or methods on the excelType variable. So as we can see, Dynamic C# provides a very powerful mechanism that compliments the statically defined C# bindings and can also be used to interact with other dynamic langauages like Iron Python etc without much code clutter.